A 79-year-old female patient presented to the emergency department at our tertiary care teaching hospital with a history of shortness of breath and fever for 3 days. 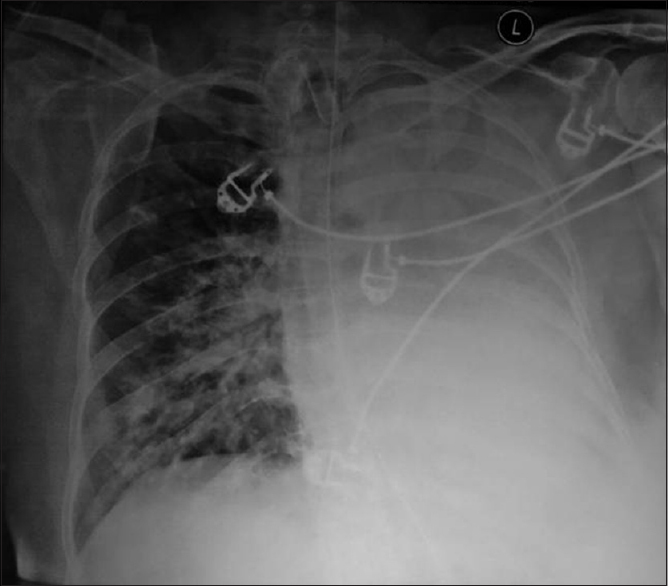 In view of respiratory distress, she was intubated and was started on mechanical ventilator support. On further evaluation, she was found to have community-acquired pneumonia due to influenza A virus infection, and she was shifted to the medical intensive care unit for further management. She developed sepsis with multiorgan dysfunction; she was managed accordingly with antibiotics and other supportive measures. Tracheostomy was done on day 9; 3 days following that, she became tachypneic, and on clinical examination, breath sounds were diminished all over the lung fields on the left side. Chest X-ray was done and it revealed left lung absorption atelectasis [Figure 1]. 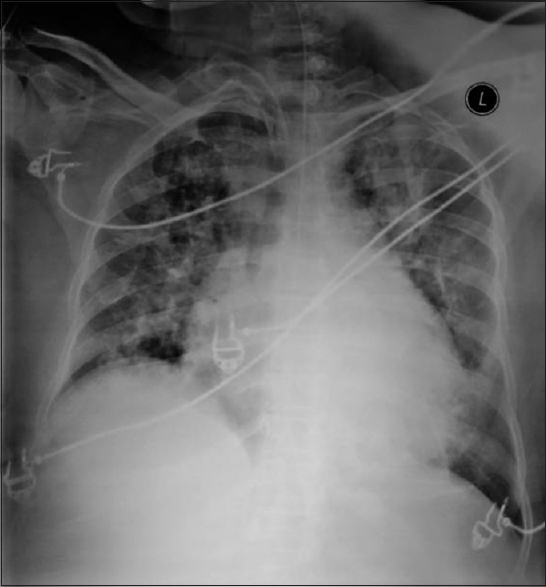 An organized blood clot was removed on repeated suctioning with mucolytic agents and following that recruitment maneuvers resulted in expansion of collapsed lung [Figure 2]. She was weaned off from the ventilator support, and after decannulation of the tracheostomy tube, she was discharged in hemodynamically stable condition. On follow-up, she was doing well. Although bronchial intubation of the right side most often leads to acute left lung collapse, the possibility of other causes such as obstruction of left bronchus due to mucus plug, blood clot, foreign body aspiration, and large pleural effusion should be considered. Management includes chest physiotherapy, repeated manual lung inflation with frequent suctioning, and postural change with mechanical ventilator support to maintain adequate ventilation. Fiberoptic bronchoscopy remains the method of choice for both diagnosis and treatment of lung collapse due to obstruction if above measures fail. The present case highlights the importance of meticulous clinical examination, and timely management of acute lung collapse results in decreased morbidity and better outcome in patients with absorption atelectasis. Marchiori E, Hochhegger B, Zanetti G. Opaque hemithorax. J Bras Pneumol 2017;43:161. Kreider ME, Lipson DA. Bronchoscopy for atelectasis in the ICU: A case report and review of the literature. Chest 2003;124:344-50.